The Home screen on your Samsung Galaxy tablet has two types of backgrounds, or wallpapers: traditional and live. Live wallpaper is animated. A not-so-live (traditional) wallpaper can be any image, such as a picture you’ve taken and stored in the Gallery app. Long-press any empty part of the Home screen. The empty part doesn’t have a shortcut icon or widget floating on it. Upon success, you see the Home Screen menu. The Set Wallpaper menu appears. You can choose to set wallpaper for the Home screen, the lock screen, or both screens at once. Choose on which screen to set the wallpaper. 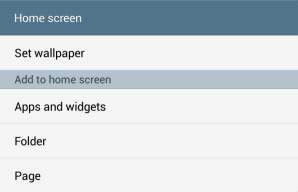 Choose Home Screen or Lock Screen to set separate wallpapers for each screen. Choose Home and Lock Screens to set both to the same image. Choose the wallpaper image source. Gallery: Choose a still image from the Gallery app. Wallpapers: Choose a wallpaper from a range of images preinstalled on the tablet. Additional types may show up, depending on the apps installed on the tablet. For the Gallery option, browse the albums in the Gallery app to select an image. Crop the image to select the portion you want included on the Home screen. For certain live wallpapers, the Settings icon may appear. The settings let you customize certain aspects of the interactive wallpaper. Touch the Done or Set Wallpaper button to confirm your selection. The new wallpaper takes over the Home screen, the Lock screen, or both screens. If prompted, be careful how you crop the wallpaper image. When both Home and Lock screens are chosen, zoom out (pinch your fingers on the touchscreen) to ensure that the entire image is cropped properly. The Zedge app is an über-repository of wallpaper images, collected from Android users all over the world. Check out Zedge at the Google Play Store.